English-Vietnamese Picture Dictionary and the home work book (included)! 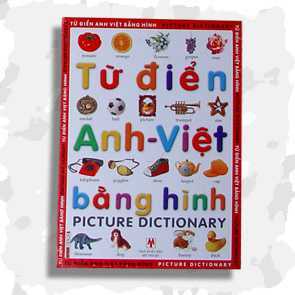 This dictionary help children enrich the vietnamese and english vocabulary and develop their reading skills. It is a great book for a beginning bilingual children. The vocabulary is divided by topics with provocative pictures. This book is good for both vietnamese and non-vietnamese speaking children. Topics include: Toys, Shapes and Colors, In the Classroom, In the Playground, The Body, The Face, My Day, Clothes, Numbers and Time, Positions, Sports, Having Fun, Opposites, Animals, Foods, In the Home, Transportation, The Family, Seasons and Weather, At the Beach, In the Town, In the Country, The Earth, Space, Jobs, Music.